Normally, my Baron BE-55 has blown a little oil out of its breathers and burned a little more so that I rarely added oil - just let it burn down to about 8 quarts and then changed it out. Since I bought the plane in December of 1999, that simple reminder system has always worked fine and we changed oil about every 35-50 hours or so. I noticed recently that my 1700 hour engines are beginning to use a whole lot less oil - about two or so quarts in the last 95 hours. I wondered why. My journey of discovery started a year ago with the "Beech Boys" -- an internet forum in which I participate, mostly reading interesting emails from other owners of Beech Barons and Bonanzas about maintenance and "how to fly" issues. Participants include George Braly - one of the developers of the GAMIjectors; Tom Turner - an oft-published flight instructor; John Deakin; Walter Atkinson; Jeb Burnside; Peter Bedell and many other very experienced and knowledgable pilots and aviation writers. "Old Bob" Siegfried is a one-man wealth of information. I had spent an adult lifetime, now approaching 4000 flying hours, in my own aircraft - beginning with a Cessna 175 Doyn conversion, then a Bonanza 36, a Baron BE-58P, followed by a Cessna Caravan and now a BE-55 Baron. Always interested in learning more, I trained at FlightSafety for the initial couses in the P-Baron and Caravan, have attended the BPPP clinics several times, and work annually with private instructors on recurrency, as well as reading widely. So I felt that I was "up-to-date." Well, maybe not! Comments by some of the "Beech-listers" began to get me interested in their experiences - and particularly those running on the lean side of the Exhaust Gas Temperature (EGT) curve. Having had a full engine monitor in the P-Baron, I was generally familiar with operation and interpretation of those earlier instruments, but was reluctant to install such a monitor and balanced injectors on my B55 with its IO-470 engines aproaching overhaul. The cost of the JPI was about $7500 installed and it made little sense to add GAMIjectors when I was considering a Colemill upgrade at overhaul time. Nor did I have any particular interest in running on the lean side. "You are not supposed to do that" is what we all were taught back in the sixties. In addition, I am pre-inclined to trust both Beechcraft and Teledyne Continental Motors which does not encourage the LOP (Lean-of-Peak EGT) technique in any of my aircraft POHs and even less inclined to listen to a few people in a small shop in Oklahoma who I had never heard of. But I had been reading Braly's comments carefully and became convinced that he knew his stuff. Deakin's articles on AvWeb - on engine management - just reinforced my confidence, and particularly as to the takeoff fuel flow setups. So, my maintenance crew at Virginia Aviation and I actually spent some considerable time learning how important it was to have fuel pressures set up so the engines are rich enough at takeoff to keep the cylinder head temperatures down. Ultimately, I just came to believe that a JPI-GAMIjector combination might make the engines run smoother. I slowly decided to bite the bullet. Do you prefer a video explanation? See this superb summary from Martin Pauly; it's so clear and so well done that it's added here 15 years after the original article was published. It's 25 minutes but absolutely worth the time. The late-technology JPI-EDM 760 Twin monitor was available and it offered new functionality well above and beyond my older-technology P-Baron monitor. George Braly at GAMI suggested that I install this monitor first, getting to know how it worked while learning how to interpret the data it produced. Then, he suggested, we could add the GAMIjectors and try to smooth out the engines which - with stock injectors - really would not run smoothly at or near peak Exhaust Gas Tempartures (EGT) as shown by the factory single-probe gauge. 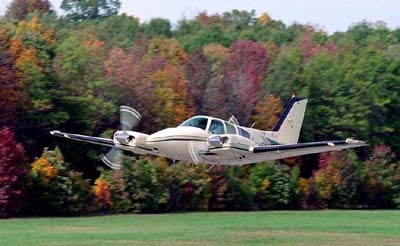 The JPI EDM-760 Twin was installed in June 2002 and this pilot began a journey of discovery. The first thing to happen was an engine failure on takeoff, - caused by a blocked fuel line -but that's another story, unrelated to this one, except that it was extremely educational as to how the trapped JPI data can be used in a "what happened?" analysis.. I found the data analysis interesting and -- with the good help of ABS members Ed Livermore from San Antonio, and Jim Shannon here in Virginia -- learned how to use MSExcel to graph the massive data sets that were stored by the JPI. The folks at JP Instruments were exceptionally helpful, too -- particularly, Scott Kelleher at JPI technical support, who patiently answered a lot of my dumb questions. "How to download to a Palm, sync to a Windows CPU, decompress and email the file to my iMac and then analyze the data?" A bit overwhelming at first and admittedly awkward, with his help this is now a routine procedure. Having learned how to interpret what the data was saying, I then installed the GAMIjectors in my two engines that were approaching recommended overhaul times. Sounds crazy? Maybe, but I knew they were in really excellent shape, on oil analysis, with no problems whatsoever and we were clearly going to be able to run well beyond TBO, as many IO-470s do routinely. In fact, I was planning to take the engines and the plane to far north Canada a few weeks later. (This travelogue was reported in the Feb 2003 ABS NEWS and is also available here ). We installed the GAMIjectors and immediately began analyzing data and swapping out injectors to make the peak Exhaust Gas temperatures occur at the same time - smoothing out the engines as we did so, while searching for the minimum "GAMI lean spread". That initial learning period was interesting because it created a lot of emails and opportunities to learn more. But we immediately had problems in the installation. The engines got better but would just not smooth out. After some discussion with the immensely helpful John-Paul Townsend at GAMI technical support, George Braly suggested that we had an induction leak on our engines. Sure enough. Several of the intake manifold drain line checkvalve balls were missing from their seats on each engine. These are sucked closed by the vacuum within the intake runners as the engines are operating (remember that 15 " showing as manifold pressure is really a partial vacuum to the extent of the difference between the 15" on the gauge and the ambient pressure at the aircraft's altitude). When we replaced the checkvalves, the right engine went smooth as butter, but the left remained rough. That's why they put two engines on Barons; to drive the owners nuts trying to get everything and every gauge to match exactly! Braly said we still had an intake leak on the left side. I said we did not, because Randy Tucker's really good crew at Virginia Aviation in Lynchburg VA had becomeinterested in what we were doing and had looked hard at the intake plumbing. They had pressurized it and could find no leaks. I shrugged it off and kept running the engines the way I always had, at about 50F or so on the rich side of peak. The engines were still much smoother than they had been...and we headed to northern Labrador. I could not have been more pleased with our progress, but the left engine still would not run really smoothly on the lean side of peak when I occasionally experimented, and being a picky aircraft owner, I still wondered if I could improve things. I kept changing the engine oil as the levels went down to eight and put in new oil about every thirty or forty hours. The whole time the engines were not leaking, but they did blow oil out the breathers, making a small mess aft of their mounts and along the flaps. I signed up for the second class, and arranged to come out early and let the GAMI shop figure out why the left engine 2,4,6 cylinders were leaner than those on the right side of the engine. I flew out in my Baron with USMC Col. Ron Gatewood, the operator of Warrenton Flight Center in Virginia, and owner of a Piper Chieftain which has very complex turbocharged engines. The day before the Seminar began, Ron and I watched the GAMI crew pull off my left-side induction airbox, and re-run all the previous tests, and ... as I suspected ... there were no leaks, which puzzled us all. Instead of giving up, everyone at GAMI got more interested and more involved.. I must add that GAMI has the sharpest bunch of engineers and aircraft mechanics I have ever met. After lots of serious discussion and hair-pulling, GAMI's chief of maintenance, David Landreth, noticed that the curved inside throat of the airbox divider was shinier on the left side than on the right side and suggested that the cause was the extra flow of air after 5000 hours on the airplane. But why? The intepretation was that while the induction system was perfect as to leaks and design, some tiny anomaly existed which offered less resistance to the left side airflow (or more to the right side) with the result that the 2,4,6 cylinders were running leaner than the right side 1,3,5 were. We discussed some different approaches to correcting the problem and when I got home we reworked the airbox and logrunners just slightly so the left engine began to run just as smooth as the right engine. While we were at it, we installed the GAMI "hole-in-the-wall" baffling fix to keep the number six cylinder heads cooler. That worked, too, by ~30dF. Now, we are getting somewhere!! In the meantime, off we went to the Advanced Pilots' Seminar. The Braly-Atkinson-Deakin Seminar comprised three of the most intellectually stimulating days I have ever spent in aviation, since I began flying in 1965. I think I know my Baron well, but I'm sure I know more about safe and wise operation of my engines today than I did before the seminar! Watching the data pouring out of the GAMI-injected magneto-ignited engine running on the fully-instrumented test stand just enhanced the experience. (The engine can, while running, switch over to PRISM automatic spark timing and/or use three types of fuel - including autogas). The participants would ask the presenters about a situation, and the engine could replicate the condition. Ron Gatewood and I arrived at Ada to find the same engine used in his Piper Chieftain -- the complex Lycoming TIO-540 J2BD -- running on the GAMI test stand. On the first engine run while using Piper's Chieftain POH settings, we saw that engine running into near-detonation on every takeoff. Ron got interested, real fast. In fact, before our seminar was over, he called home from Ada and told his crews to change their operating techniques immediately. In my opinion, the folks at GAMI are going to change the world of piston aviation for the better, and they have the hard science to back up their ideas and claims. The really clear and fabulous slide presentations, and the "let's keep going" attitudes of John Deakin, George Braly, and Walter Atkinson made the Seminar fast-paced and really fun... even when our brains were nearly overwhelmed with new information... a new way of thinking.. While I had previously read most of the literature that was discussed, the seminar put all the engine management issues into context far, far better than my "home-study" had done. The instructors emphasized that the principles discussed applied to any piston engine: Harleys, Briggs & Strattons, Continentals or Lycomings, GreyMarines, Curtiss-Wrights, Pratts, etc. Incidentally, I have heard some pilots (who have not attended the seminar) say that all the Seminar teaches is how to run on the lean side of peak EGT. Not at all true. While there are lots of jokes about the "Church of the Lean of Peak", there is a much greater emphasis on how to understand the internal cylinder pressures and resulting temperatures, than whether to run on the rich or lean side. Where to operate is the pilot's choice. It's obvious, though that pilots must either run far richer that we were all taught, or get over on the lean side, if the engine can do it smoothly. Here's where the GAMIjectors and the state-of-the art engine monitors come in. When the POH's were originally written this equipment did not exist; now we have modern tools to diagnose engines and accessories to make them run better. Throughout the seminar, the "Preachers" made it repeatedly clear how impressed they were with the accuracy of the old TCM and Lycoming engine graphs. Most of these were generated by hand calculators and slide rules long ago, and are still precisely correct, matching exactly with the far-better-instrumented engines on the GAMI test stand. The respect that GAMI has for these long-retired engineers is obvious, as the test stand is named in honor of Carl R. Goulet, a retired TCM engineer. The bright and exceptionally knowledgable class participants made the event a true graduate seminar instead of a lecture series.. It was just great...the class was full of very experienced pilots, all of whom contributed real-life experiences and examples that we discussed. My friend Ron Gatewood who came with me was a 30 year career Marine aviator and he knows a little about airplanes...and now flies several very sophisticated twins, in addition to his personal Bonanza which he flew to Virginia from his previous duty station inSouth Africa - and he teaches multi-pilots and he was also extraordinarily impressed with what he learned. Regardless of one's experience a pilot is likely to benefit significantly. I joked to one fellow student that the experienced, high-time, and grey-haired pilots at that seminar reminded me of the TV ad currently running for NEXIUM... wise looking mature people saying "I didn't know" "....didn't know"... "I didn't know"... "I didn't..." "I didn't know" "I didn't know".... Well, there was a helluva lot that this pilot didn't know. Colonel Gatewood and I had a great time playing with my Baron on the 4:30 flight home, trying out everything we could recall, and it all worked, too. We left Ada and visited Glen Biggs' Chandler OK strip, but we did not refuel... cruising thereafter at 11,000 MSL ... so (with two takeoffs and two climbs) we made it nonstop to Charlottesville VA. The JPI "LoFuel" alarm went off on final... meaning that we then had one hour left... IFR legal reserves. I would not have been able to do that -- even from Biggs-dir-Charlottesville -- the way I set up my engines before the seminar...and the temps stayed OK all the way...we got there only a minute or two slower than we would have the old way. So where is this story going and why the greatly reduced oil consumpation? What's so different now? Two things: this pilot knows more than he used to and his engines now run so smooth that they can run very comfortably lean of peak whenever he chooses, which is almost all the time. Fuel burns are down, endurance is up, engine cylinders run much cooler, engine EGTs are perfectly normal, and the oil seems cleaner. There is - very strangely - no more oil seeping out of the breathers and very little showing up on the flaps aft of the engines. If anyone tells you IO470s will not run smoothly lean of peak, I'd suggest that you try to learn more. They can. They can! We flew the Baron 280 hours in 2002 and it went in for annual in Jan 2003. Fresh oil then, of course. No squawks at annual, except for one slightly sticky valve so we pulled that cylinder and replaced it. Since January 2003 we flew 95 hours. In May 2003 I was dipping the oil and noticing that the levels were still 11 on the right side and 10 on the left. (for some reason when we put in 12, the dips read 13). Five months, 95 hours, two to three quarts used? What's up, Doc? Unbelievable. These engines are now ~200 hrs past TBO and running like fine watches, but why the 2-3 quart use in 95 hours? I had no idea. I called George Braly. He laughed and said "Don't you remember the test stand demonstration? When running lean of peak, the peak power pulses within each cylinder are significantly lower for the same power output than on the rich side of the EGT curve. If the pulses are lower, there is less blow-by past the rings. If there is less blow-by, there will be less pressure in the crankcase and less oil blown out the breather." Well... I will be dipped... everything they said in the Seminar suddenly makes even more sense. To run leaner is to run cooler, run cheaper, run longer, even faster, etc. They never said I'd be using oil at the rate I am now. Both of my engines sound more like turbines than piston engines, they just purr - there is no other word for it. When I called Ron Gatewood to tell him what I had observed, he responded that the same thing happens when he runs his Chieftain on the lean side: much less oil blown out of the crankcase, and he had also wondered why that was. I have wanted to put a set of Colemill IO550 engines on this Baron someday and several pilots I respect greatly know that. Randy Tucker - who maintains this Baron as my Virginia Aviation shop manager and is a pilot himself - and Mark Hegg in Denver - another very experienced Baron owner - after hearing this story, both asked exactly the same thing: "You are not going to take those engines off now, are you?" Well, maybe not for a while, yet. As this is written, it's February 2003 and I'll want to take engines I trust to Alaska in July. For me, this whole process has been a most interesting journey of exploration and discovery. To succeed, it takes four things: a team of committed mechanics to set the engines up correctly, a full engine monitor, a set of GAMIjectors, and a little knowledge of what do do with all of this old and time-tested, but recently rediscovered information. For the sequel.... Read here what happened to the first pilot ever to read this article! !